As it does with every new iOS release, Apple on Thursday stopped signing legacy iOS 11.3.1 code after last week's release of iOS 11.4. Apple typically ceases code signing roughly one week after issuing a fresh version of iOS to ensure iPhone, iPad and iPod touch owners are running the most up-to-date software on their respective devices. 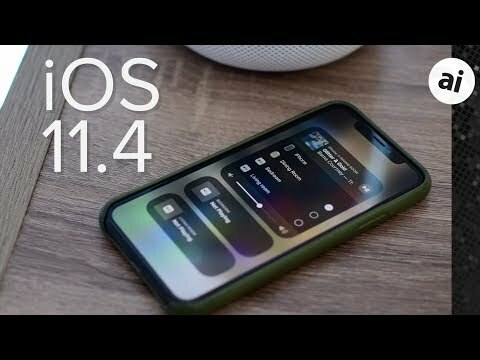 True to form, iOS 11.4 was released last Tuesday. The latest mobile operating system update delivered two long-awaited features in AirPlay 2 and Messages in iCloud, as well as support for Apple's new ClassKit framework. Announced at Apple's Worldwide Developers Conference last year, AirPlay 2 is an updated iteration of the company's wireless streaming protocol that boasts a robust connectivity backbone, support for multi-room audio and other enhancements. Messages in iCloud, also unveiled at WWDC 2017, is a new feature that synchronizes Messages conversations between multiple Apple devices logged into the same Apple ID leaving only the latest messages stored locally. The system stores chat histories in iCloud, freeing up space on user devices. Apple regularly stops signing code in an effort to prevent users from installing old iOS versions. In addition to system security, restricted code signing helps ensure users have the most up-to-date firmware running on their iPhone, iPad and iPod. The company this week issued the first iOS 12 beta to developers at WWDC 2018, bringing with it a slew of new features including Siri Shortcuts, Group Facetime, performance enhancements and Memoji for iPhone X, among many others. Check out AppleInsider's full coverage of iOS 12 for a complete rundown on the OS set to launch later this year. Never had the want or need to downgrade my iOS or macOS software. Never experienced the show stopping "bugs" some claim with each version. I just updated my system to the latest version. 2 days passed, no new bug found. feeling so lucky. Previously, my phone doesn't lock the screen automatically sometimes when the system is 11.1.3.